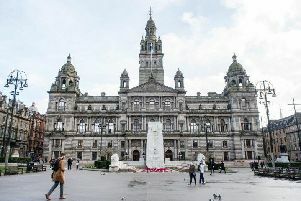 A ROW has broken out over ­official plans to commemorate the outbreak of the First World War, with claims the Scottish Government’s proposals are a “whitewash”. Alternative plans are being drawn up by a leading think-tank amid concerns that the programme unveiled by First Minister Alex Salmond last week is dominated by “Establishment and military” figures. The Jimmy Reid Foundation says not enough consideration is being given to the justification for the conflict and to the stance taken by conscientious objectors. Mr Salmond insisted last week that the official plans, which begin with an event at Edinburgh Castle in August next year, would be a “commemoration not a celebration”. But the foundation insists there are “widespread concerns” that it will not ask why the war was fought and address the needless loss of life in which more than 100,000 Scots were killed. It is to establish its own committee, including historians Dr Neil Davidson and Professor Chris Harvie, which will focus instead on those who suffered and those who tried to stop it. Chair of the committee Isobel Lindsay said: “Some of Scotland’s finest had the foresight and courage to resist the fatal misjudgments of politicians and generals who sent millions to their death and created the conditions for the rise of Hitler. The Scottish Commemorations Panel announced by Mr Salmond last week is to be headed by former army chaplain Norman Drummond and includes professionals from the military and ­veterans’ ­communities, community ­leaders, ­clergy, media, historians and education specialists. Mr Salmond said the programme would focus on how to ensure such a conflict must “never happen again”. But the Jimmy Reid Foundation is concerned there is little representation of groups such as conscientious objectors, the peace movement and the millions of working-class men were “sent to their deaths” in the conflict between 1914-18. Its committee also includes trade unionists Jackson Cullinane and Richard Leonard; the former leader of the Iona community, Kathy Galloway; Women’s International League for Peace and Freedom member Helen Kay; John Ainslie from Scottish CND; and community activist Bob Holman. A Scottish Government spokeswoman said: “Scotland’s First World War commemorations will give the whole of the country the opportunity to reflect on Scotland’s significant role in that conflict.